This AC OEM style emblem is made of acrylic and is made to fit into the center of our 6 bolt steering wheels. This is a one piece unit that is held in by friction. Diameter: 3 1/8" OD. 1 7/8 Where it press fits into steering wheel. AC Cobra center insert badge. Previously used with a baking plate for 6 bolt steering wheels, but can be used anywhere including on the side of your toolbox. Comes with strong adhesive backing. OEM Cobra® boss steering wheel adapter in six bolt format. This is needed to attach our steering wheels to your steering column. There are no horn control button provision on 6 bolt boss adapter (most mount a switch or button). 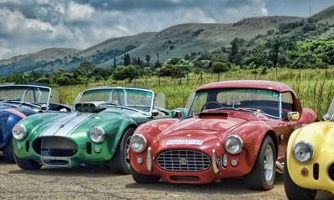 Used on Shelby Cobra 289 and Shelby Cobra 427. 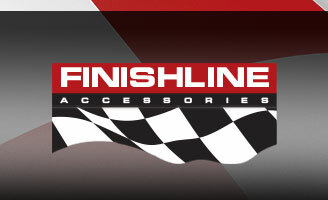 Available in either Ford, GM or OEM (+$40) spline format. This Cobra® emblem is made of acrylic and has a peel off back with strong adhesive to that will keep it locked in place. This emblem fits in the center cap (horn) on our 9 bolt steering wheels, the aluminum shifter knob and as inserts on certain spinners. Package includes one emblem. This Cobra OEM style emblem is Red White & Blue made of acrylic and is made to fit into the center of our 6 bolt steering wheels. This utilizes a billet backing plate that press fits into the center of the steering wheel and a high quality metal backed emblem instert. Diameter: 3.25" OD 1 7/8" where it presses into steering wheel. This Cobra OEM style emblem in black and silver is made of acrylic and is made to fit into the center of our 6 bolt steering wheels. This utilizes a billet backing plate that press fits into the center of the steering wheel and a high quality metal backed emblem instert. Cobra center insert badge. Previously used with a baking plate for 6 bolt steering wheels, but can be used anywhere including on the side of your toolbox. Comes with strong adhesive backing. GT-40 OEM, Wheel. (Manufactured in England by Moto-Lita LTD) Moto-Lita, blue leather wrap, black spokes, flat GT-40 OEM wheel. Available in 14" or 15". Center emblem not included. Drilled to fit original Moto-Lita 6 bolt boss. *Special Order Items-Must be paid in full at the time the order is placed. Shipping may be up to 6 weeks. Laminated with riveted rim, or wrapped in Leather, original fit specification Jaguar E-Type wheels for Series 1, 1.5 and 2. Available in 15" diameter only. This wheel must be fitted to the original boss. This option may also be fitted to series 3 V12 cars. This wheel must be fitted with the series 1-2 OEM boss kit and OEM horn control (Not Included). Special Order - Please be advised that this item will take 4-6 weeks to arrive from England. Made in England by Moto-Lita. Original specification Jaguar E-Type wheels for Series 1, 1.5 and 2. This wheel must be fitted to the original boss. This option may also be fitted to series 3 V12 cars. This wheel must be fitted with the series 1-2 OEM boss kit and OEM horn control (Not Included). Available in 15" and 16" diameters. Special Order - Please be advised that this item will take 4-6 weeks to arrive from England. Made in England by Moto-Lita. MK3-6 Bolt FinishLine steering wheel, with the Moto-Lita 6 Bolt pattern. 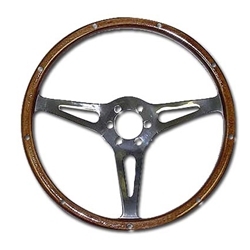 Made from laminated mahogany and birch woods, this steering wheel is dished with polished spokes. Diameter is 15" with an 1.24" dish. . Requires a 6 bolt boss adapter. Black leather wrapped MK4 6 bolt steering wheel. Available in 15". 6 bolt boss adapter required, and sold separately. The ORIGINAL Cobra Split Spoke Steering Wheel! Original equipment on Cobras® made of laminated mahogany and beech on a alloy frame with nine rivets and split polished spokes. It is dished, slotted and OEM standard size of 16". Also available in 15". Needs a 6 bolt boss adapter and a 6 Bolt Top Ring. 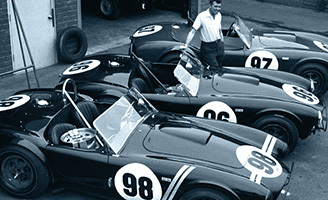 Used on Shelby Cobra 289 and Shelby Cobra 427. Billet aluminum competition quick release steering hub for 1965 through 1968 Mustangs. Fits the 6 bolt MK3, MK4 and Shelby steering wheels. Quick release hub has 40 splines for 13/16" shaft. Easy bolt on installation. No permanent modifications. Safety and convenience of quick release racing wheel. This is the totally original Shelby Mustang wheel; as supplied by Moto-Lita in 1965 and 1966. All wheels are dished (1 1/4") with spoke finish in polished aluminum with Cobra slots. This is the OEM Shelby Mustang steering wheel made from sold Mahogany. Requires a 6 Bolt Boss Adapter. OEM style turn signal switch. Housing will fit perfectly in front of the original barrel hub. Provides turn signal with lever action and self return with a push button for dimmer and/or horn control. Black. Each.